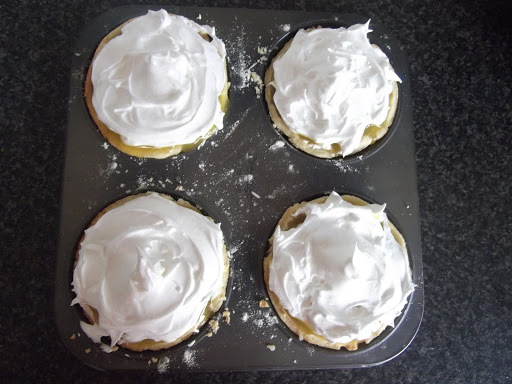 Today I’m sharing a simple recipe for lemon meringue pie. I had some shortcrust pastry left over from a quiche I had made a few days ago and was trying to think of something interesting to do with it. I hate throwing scraps away so I wanted to turn some raggedy bits of shortcrust into something special. I knew I wanted to do a sweet but had to consider what I had in the house! I had some chocolate, but no cream and only two slightly ageing eggs which meant that my options were somewhat limited, but I soon settled on Lemon Meringue pie! These are extremely simple to do and the quantities in this Lemon Meringue Pie recipe can easily be adjusted depending on the number of guests to dinner. The ingredients are also surprisingly cheap! Roll the pastry out until half a centimetre thick, and line muffin tins. Blind bake in the oven for 8-10mins at gas mark 6 (leave the oven on while doing the next stage to ensure it is pre-heated). 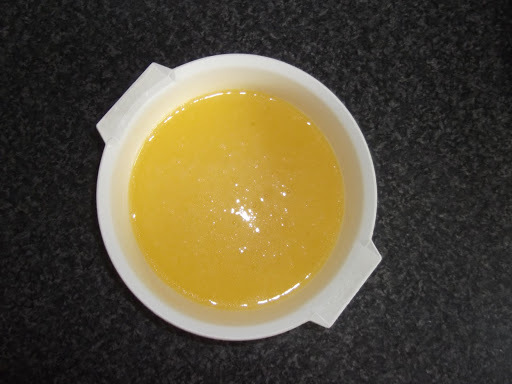 The lemon curd can easily be done in the microwave. Put all of the ingredients in a microwavable bowl (but do strain the egg first! ), and zap for 1min. Give it all a good stir to ensure there are no lumps and zap again for a further 1min. Then slowly add the caster sugar (I recommend on tbsp at a time!) Once it has gone thick and glossy it is ready! Pour the cooled curd into the pastry cases. 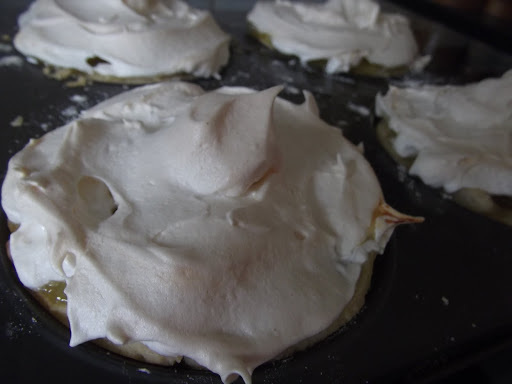 Then top with the meringue. These can be served hot straight out of the oven, or be left to cool!